As with any new web framework, getting started can seem daunting. Even though Django has some of best documentation of any framework, it can still be a pain to figure out how things work. The goal of this post is to help you, the Django newcomer, get up an running with a simple blog. Virtualenv can be installed using pip, and virtualenvwrapper can be installed by following the instructions on it’s site. Once you have both of these installed, you’re going to create something called a virtual environment. A virtual environment allows you to install any packages you need for your Django development without having it interfere with the rest of your system. It also allows you to create a requirements file, which allows other people to replicate your environment. To get started, we use the mkvirtualenv command. If you at some point close your terminal window and want to load your virtual environment again you can use the workon command. If by chance you don’t want to work on this environment any more, you use the deactivate command. So bringing it all together, we’re going to create an environment, create a directory to play around in, and then install django. Now that we have our environment set up we need to create our first project. We’re going to call it “blog”. If you look in the blog directory now, you’ll see two things: a folder named blog and a file named manage.py. The manage.py file is used to administer your project. Using it you’ll sync model changes, run the server, and collect static assets. So why don’t we try running the server? sqlite> .tables #Look ma, no tables in here! A Django powered website consists of many smaller “apps”. For instance, a blog may have a posts app and a photo app. The idea is that things that aren’t concerned with each other (photos,posts) should be separate entities. For our blog projects we’re going to only use one app, and we’ll call it posts. If you check out your project now, you’ll see a new directory called posts. If you descend into that directory, you’ll see 4 files. __init__.py: Let’s Python know that this directory is a package. This has more uses, but it’s beyond the scope of this post. models.py: We define how our models (tables) should look and act. views.py: This is where we grab data from out model, massage it to our needs, and then render it to a template. tests.py: Unit tests go here. Just because the app is created, doesn’t mean that Django recognizes it. You actually have to add the app to the INSTALLED_APPS section of the settings.py file. To do that, add a line to the end of the INSTALLED_APPS list. 'posts', # Don't forget the trailing comma! If we hadn’t added the posts app to our settings.py file, the syncdb command wouldn’t have generated our table for us. 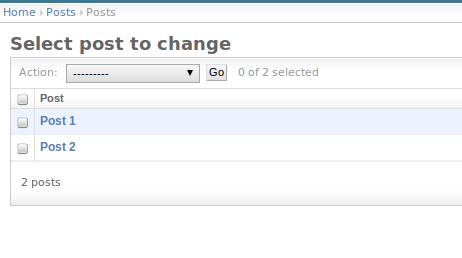 One of the best parts about Django is it’s free admin interface that you get. The admin isn’t enabled by, but it’s pretty easy to set up. First off, we need to open settings.py and uncomment two lines. All this does is let the admin know that it can manage your model for you. Since you technically added a new app (the admin app), you’ll need to run syncdb again. Now that you can see the Posts model in the admin, click the “add” button next to it. When you do, you’ll see a form like this. Enter a title and some content, and then click “Save and Add Another”. Enter another title a and some content, and then click “Save”. You’ll be presented with a screen with two entries on it, that both say “Post object”. Now when you view your post list, you’ll see the post titles instead of “Post object”. 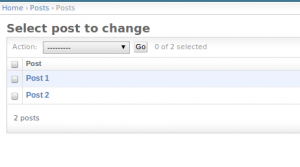 We now have a few posts in the database and can edit them in the Django admin. The next step is to set up our url structure that will allow users to view the posts on the front end of the site. Open urls.py and add the lines to it that have the “#Added” comment at the end of them. The ability to raise a 404 error. The two functions we created are pretty straight forward. The home function takes all of the posts, and sends them to the “home.html” template where they will be rendered. The post_specific function checks to see if the post id that is passed in exists. If it does, it grabs that post and sends it on to the template. If it doesn’t, it raises a 404 error. Now, we need to make those templates. Once everything is saved, go to http://127.0.0.1:8000 and check out your (simple) blog! This is a very simplified tutorial. The goal is to help someone get started with something easy without getting bogged down in details. 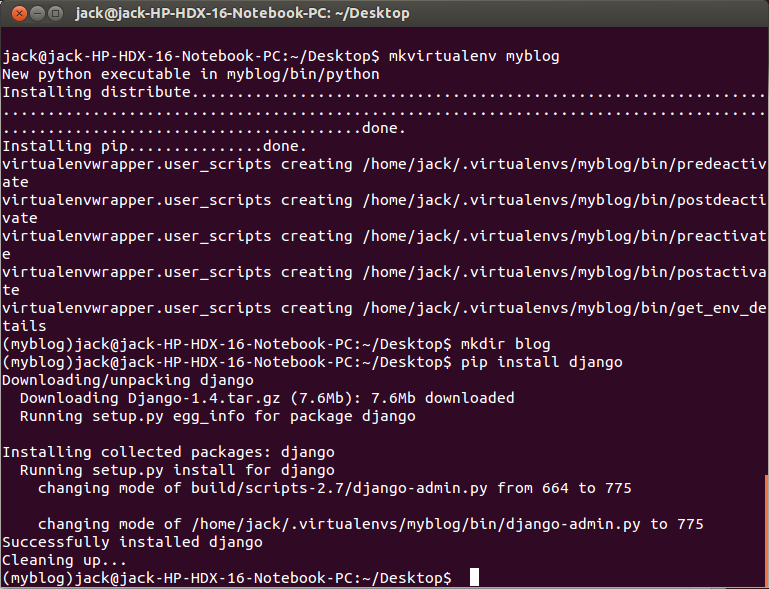 One of the greatest things about Django though is that the more details you learn, the greater it gets. With that in mind, I highly suggest checking out the following sites for more learning. Good luck! https://docs.djangoproject.com/en/1.4/ – The official Django documentation. Django has some of the best documentation out of any open source project, so don’t be scared of diving in. Be sure to check out the 4 part tutorial It covers some of the same things I did, but in much greater detail. http://www.djangobook.com/en/2.0/ – A lot of the material in the DjangoBook website is out of date, but it does a great job explaining some key concepts that are still relevant. http://www.reddit.com/r/django – The Django sub-Reddit is a great place to keep up with Django news and conversations.